And by "crush" what we really mean is "beat by a full 30 seconds." James Glickenhaus, the man behind Scuderia Cameron Glickenhaus (SCG), does not lack confidence. We learned this firsthand when chatting with him about the SCG003S, his first street-legal supercar. The upstart American automaker honed its cars on the Nurburgring and it’s clear that the legendary German race track means a great deal to Mr. Glickenhaus. That’s why we weren’t surprised when reported that SCG wants to destroy the track’s current lap record held by the Porsche 918 Spyder. The goal is to beat the 918’s time of 6:57 by a full 30 seconds. That is a high mark to shoot for. However, if the SCG003S is really as good as Glickenhaus says then a run of 6:27 may not be out of reach. The supercar’s 4.4-liter twin-turbo V8 allows it to race up to a top speed of 217 mph. It can reportedly pull more than 2Gs through corners on road tires . Thanks to its track-focused design there is 1,500 pounds of downforce on tap. While those are currently just numbers on paper we’re inclined to believe the SCG003S can back up all the tough talk. Give James Glickenhaus the chance and he’ll speak endlessly about with no extensive prep needed. If the SCG003S bests the 918 Spyder's record it will spark a fierce debate. After all, other cars have beaten the hybrid hypercar’s time. The first issue will be what constitutes a production car. 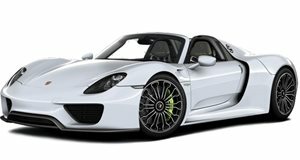 The 918 had a full production run of, wait for it, 918 cars. The SCG003S may not even do a fraction of that. Then there’s the question of whether the two are even in the same league. The 918 Spyder isn’t a daily driver by any means but it is far more civilized than the SCG003S. As we all know adding civility and livability decreases a car’s performance potential. All debates aside, SCG’s pursuit of Porsche’s Nurburgring record will be a success no matter what in that it will bring the company added publicity. We're talking about it right now. If the SCG003S succeeds in its quest and validates its promised potential James Glickenhaus may find himself with more potential owners asking him about deposits and delivery dates than he knows what to do with.